The sugar sector in Karnataka has a large water footprint, supports 700,000 farmers, covers about 430,000 hectares of land, and produces an annual sugar output of 4 million tons. 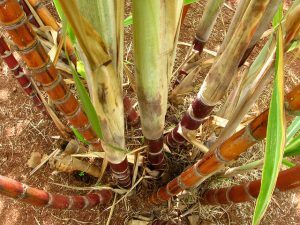 Many livelihoods depend on the entire sugar value chain, from sugarcane farmers to sugar mills. If all sugarcane farmers in the state start using drip irrigation, they could reduce their water abstraction by 2.6 billion m3 – an estimated 10 percent of the state’s projected gap between water demand and supply in 2030. The 2030 WRG is working with sugar mills, financial institutions, the farming community (through individual farmer representatives), and the government to develop innovative financing and implementation models that encourage the state’s sugarcane farmers to use drip irrigation. This will improve the efficient use of water in agriculture, while developing replicable frameworks for market-driven solutions and public-private-community participation models. The Water Resources Department of the Government of Karnataka has now made arrangements for implementation of drip irrigation across the state’s sugarcane sector. “In Karnataka, we are taking the initiative to implement one of the world’s largest micro-irrigation projects in the sugarcane sector. The program combines livelihood promotion with water use efficiency by adopting a unique model of working with sugar mills for outreach, aggregation, and capacity building of farmers. Through the 2030 WRG’s active involvement for this engagement, the state’s Water Resources Department is also promoting an innovative financing mechanism that leverages the strengths of the government, sugar mills, and financial institutions to provide repayment guarantees for loans to farmers to install drip irrigation,” said Mallanagouda Basanagouda Patil, Minister for Water Resources, Government of Karnataka. The government has allocated $250 million through its state budget to mobilize financial markets, encourage farmers to adopt new irrigation technology, and increase the participation of private and public sector financial institutions. A variety of stakeholders have worked together to provide inputs into the government policy implementation guidelines. Including key stakeholders in the decision-making process for policy transformation will accelerate implementation. The sugar mills have developed the first set of detailed project reports for implementation. These plans include alignment with financial institutions for equipment financing. “Agri-technology adoption at a state-wide scale requires access to finance. Traditional subsidy-driven approaches suffer from a fiscal ceiling on the possible farmer support realizable. The 2030 WRG’s approach of grounding the engagement in the business case for all supply-chain actors, while mobilizing financial institutions to meet the financing gap for technology promotion, has the potential to significantly expand the universe of beneficiary farmers and place agri-water front and center in Karnataka’s development priorities,” said Govinda Rajulu Chintala, Chief General Manager, NABARD. Reusing wastewater is less expensive than increasing the primary supply of water, particularly when wastewater network systems and treatment plants are planned and designed for reuse. Based on its analysis of wastewater reuse in the urban and industrial sectors of key Karnataka cities, the 2030 WRG aims to create opportunities for public-private partnerships by bringing in best-practice technology and financing models. It is preparing pilot projects in the cities of Tumkur and Bellary in partnership with the state government. The 2030 WRG is engaging with the Karnataka Urban Water Supply and Drainage Board to develop tools for assessing the cost of wastewater reuse in municipalities and industrial sectors, and to build the capacity of stakeholders. The partnership aims to establish a solutions center on wastewater reuse and strengthen the state’s ability to identify and implement opportunities to reuse wastewater. A cross-departmental multi-stakeholder platform is being formed to support the pilot city engagements, operationalize the solutions center on wastewater reuse, and strengthen the policy framework in partnership with the Urban Development Department to promote the reuse of wastewater. “In partnership with the 2030 WRG, we are working on developing a tool to estimate the cost-economics of reusing treated municipal wastewater and to market this resource within industry through PPPs. Industrial use of wastewater will free up fresh water for other uses. The 2030 WRG is helping us design the marketplace and determine whether the use of treated wastewater is best promoted by regulation, incentives, or a combination thereof. We hope the State of Karnataka will lead the way on this topic in the country,” elaborated Manivannan Ponniah, Managing Director, Karnataka Urban Water Supply and Drainage Board.